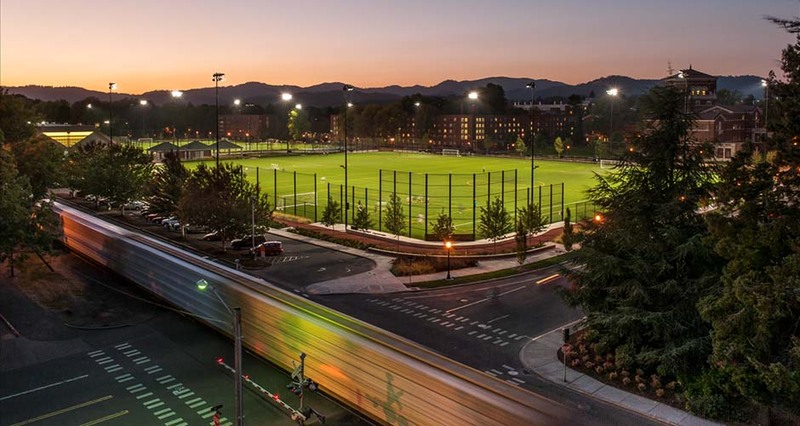 Funded entirely by student referendum, Student Legacy Park provides a much loved intramural athletic facility and campus gathering area in the core of the Oregon State University campus. The final design incorporates a wide matrix of athletic uses with an active streetscape and central activity plaza. 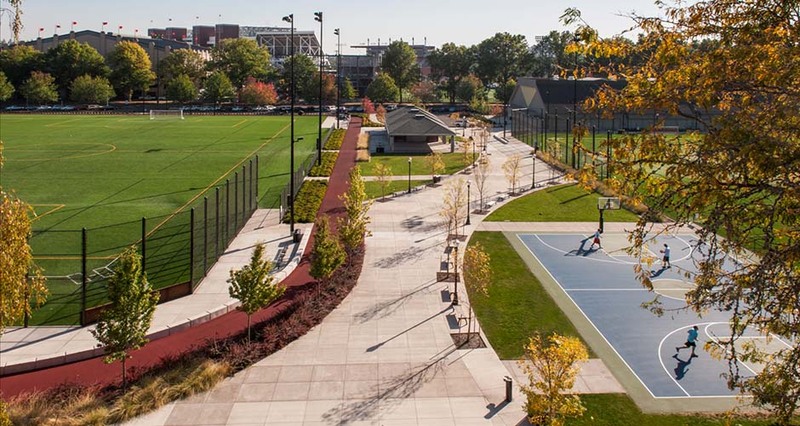 Designers developed a linear park along Intramural Way, and Mackenzie’s engineers coordinated with the City of Corvallis and university planning staff to design streetscape improvements along 26th Street, 30th Street, and Intramural Way. The design features landscaped and hardscaped entry nodes at either end of the pedestrian corridor and at the corners of 26th Street. A custom-designed shelter with an exposed heavy beam structure serves as a covered pavilion, restroom facility, and storage space. 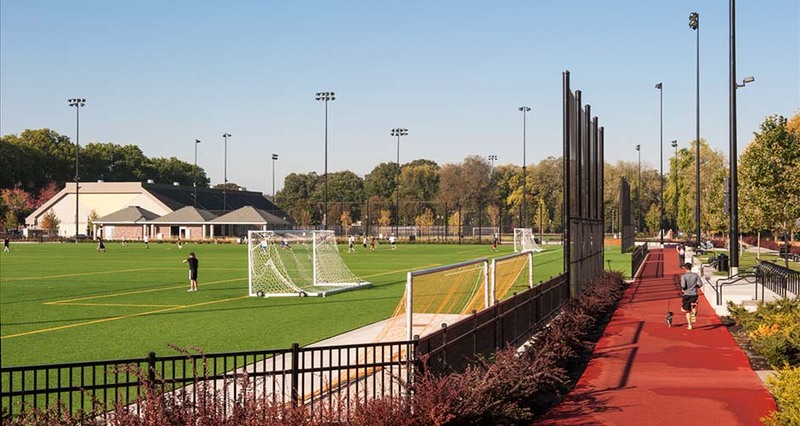 Program elements include three full synthetic turf intramural fields for multiple use (soccer, flag football, softball, lacrosse, rugby), 1/3-mile running course, six tennis courts, a full-size outdoor basketball court, and a central meeting plaza with new pavilion for gatherings and event management. 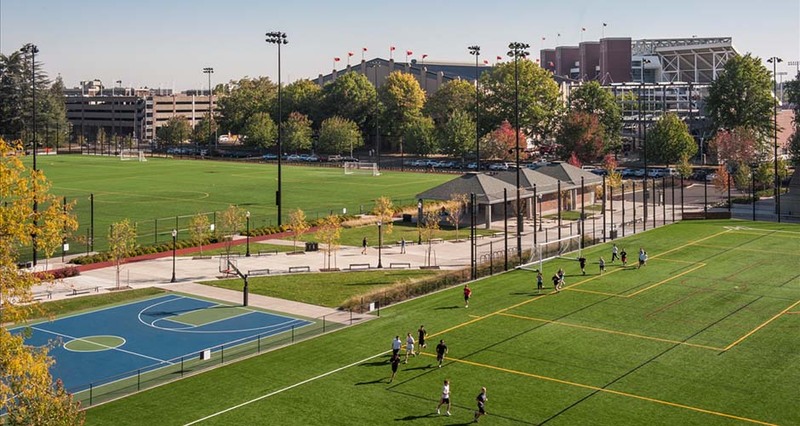 The project scope included improvements to the existing tennis pavilion with new entries oriented toward the plaza and new outdoor courts, as well as sand volleyball courts adjacent to Dixon Recreation Center. The facility accommodates student use throughout the academic year, with an average daily participation level of 1,000 students, as well as collaborative community programs and access during summer months. An efficient and thoughtful facility design allows multiple activities to occur within compact areas with minimal impact on adjacent activities. The design for Student Legacy Park employs a range of sustainable features. 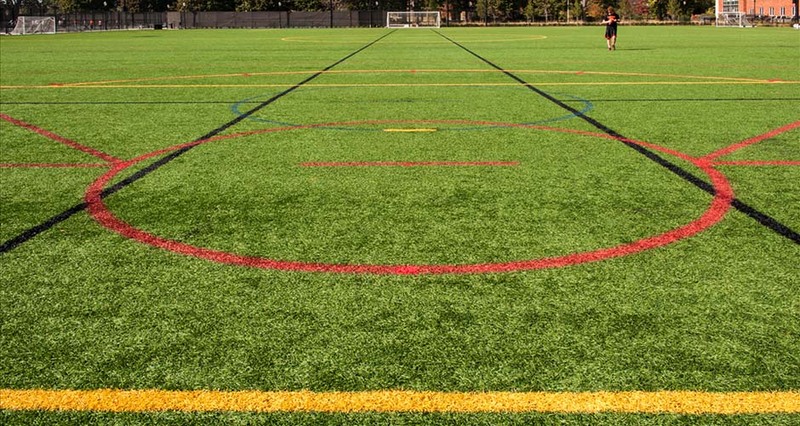 The irrigation system for the athletic and recreation fields features low-volume, high-efficiency nozzles and controllers that use weather-based data to improve system efficiency. The field lighting utilizes cutoff fixtures, with lights on timers with automatic shut-off. Stormwater solutions were designed to City of Corvallis standards, with detention under the fields and water quality provided in a pond south of the central shelter buildings. The running/jogging track utilizes a pervious track surfacing. The design team modified the original site layout to preserve several heritage trees on the west end of the site.